WASHINGTON - Oscar-winning film and stage great James Cagney will be honored on the 100th anniversary of the year of his birth when a new commemorative postage stamp is issued July 22 by the U.S. Postal Service at Warner Bros. Studios in Burbank, Calif.
"The James Cagney stamp will serve as a lasting tribute to one of our country's most patriotic and dedicated actors," said Deborah Willhite, Postal Service Senior Vice President, Government Relations. 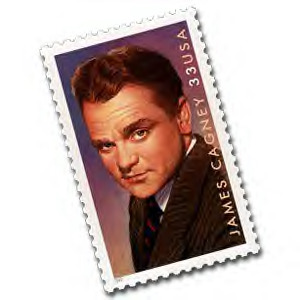 "James Cagney was a true legend of Hollywood, and the Postal Service is pleased to bring the celebration of his inspiring work to the millions of Americans who send and receive mail daily," said Willhite, who will dedicate the stamp. The James Cagney stamp will be dedicated in a ceremony on July 22 prior to a rare screening of the classic film "Yankee Doodle Dandy," in which Cagney's portrayal of George M. Cohan won him an Academy Award for Best Actor. From 10 a.m. to 4 p.m. on July 22, the public will have an opportunity to purchase the stamp, and obtain the official first day of issue cancellation and dedication ceremony program, at the Warner Bros. Studios' Tour office located at Hollywood Way and Riverside Drive. Also expected to join Willhite at the ceremony will be Sanford E. Reisenbach, Executive Vice President, Marketing & Planning, Warner Bros.; Jean Picker Firstenberg, Director and CEO of the American Film Institute (AFI); legendary film and television producer A.C. Lyles of Paramount Pictures; Casey Thomas, daughter of James Cagney; Joan Leslie, who co-starred with Cagney in "Yankee Doodle Dandy;" and Karl Malden, Academy Award-winning actor and member of the Citizens' Stamp Advisory Committee. The 12-member committee is responsible for recommending all U.S. stamp subjects and designs to the Postmaster General for final approval. "We are pleased to host the inauguration of the James Cagney stamp here at Warner Bros," said Reisenbach. "This talented actor made 46 of his movies with our studio, including the illustrious Yankee Doodle Dandy for which he made his mark as one of Hollywood's most talented and respected actors." "Through the Legends of Hollywood series of stamps, people will have the opportunity to learn more about some of the unforgettable stars of the past, and can enjoy the beautifully presented images created by the Postal Service, whether or not they are stamp collectors," he said. James Francis Cagney, Jr., was born in New York City on July 17, 1899. He began his career in show business in 1919, moving between the New York stage and vaudeville. In 1930, Cagney moved to Hollywood where he landed a contract with Warner Bros. and made his film debut in "Sinner's Holiday" (1930), a project Al Jolson owned the rights to and sold to Warner Bros. under the stipulation that Cagney appear in the film. In his fourth film, "The Public Enemy" (1931), Cagney squashed half a grapefruit in Mae Clark's face at the breakfast table, and one of the most memorable moments in the history of film was created. Cagney danced for the first time on screen in "Taxi" (1931), but officially became a movie "song-and-dance man" in his next film, "The Footlight Parade" (1933), which featured spectacular musical numbers by the legendary Busby Berkley. In 1938, "Angels with Dirty Faces" earned Cagney his first Academy Award nomination (over the span of his career, Cagney received three Oscar nominations). But, it was the biography of George M. Cohan, the flag-waving writer and composer of countless musicals, who personally chose Cagney to star in "Yankee Doodle Dandy," which would win Cagney his only Oscar as Best Actor. Produced in 1942, the classic is still Cagney's most remembered film and his personal favorite. Cagney would later say that with the exception of his wife, vaudeville had the greatest affect on his life. He always thought of himself as "Just a Song and Dance Man." In 1974, Cagney was the first actor to receive the American Film Institute's Life Achievement Award, and in 1984, he was awarded the U.S. Medal of Freedom, America's highest civilian award. He died on March 30, 1986, after appearing in more than 60 films. Designed by Howard Paine of Delaplane, Va., and illustrated by Thomas Blackshear of Colorado Springs, Colo., the 33-cent stamp features an original portrait of Cagney. The selvage on the right side of the horizontally formatted 20-stamp pane is a photo of Cagney in his electrifying performance in "Yankee Doodle Dandy." The James Cagney stamp is the fifth in the Legends of Hollywood series, which includes Alfred Hitchcock (1998), Humphrey Bogart (1997), James Dean (1996), and Marilyn Monroe (1995). More than 75 million James Cagney stamps will be printed.